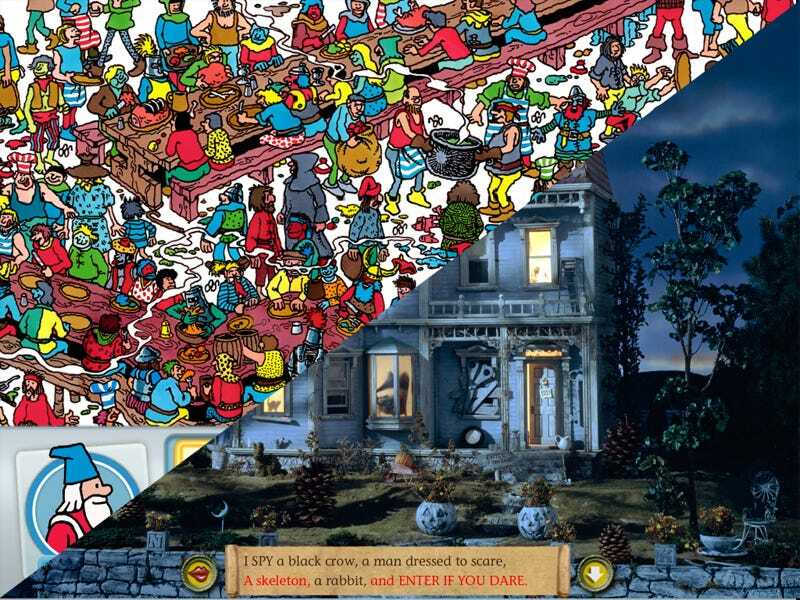 Where's Waldo and I Spy are two kids books that work best when they're held right up to the face, just like the iPad. Thankfully, both of them got gorgeous, thoughtful treatments for their newly-available iPad apps. I Spy: Spooky Mansion, presumably the first in a series of I Spy titles, takes you through a haunted old house, supplying limericks of items to search for and marking them off as you tap them in the scene. All of the panels look beautiful on the iPad, and you're allowed a little pinch-to-zoom action, letting you survey the whole scene or go up-close and flick around in greater detail. And it's not easy! I spent 5 frustrated minutes looking for the second "shoe" in the Living Room until our helpful intern Jeremiah discovered that it was actually a horseshoe. Tricky tricky. Likewise, Where's Waldo HD is an app that kids will enjoy and adults will appreciate. Its panels are familiar ones from the original Where's Waldo book, but flicking across them on the iPad, they feel bigger than ever (sadly no pinch-to-zoom here). On the iPad, the scenes are livened up with the occasional animation, and like I Spy, the app keeps track of your progress as you find and tap Waldo, Wenda, the Wizard, and various other noteworthy happenings in the scene. My only ding: the sizable progress bar at the bottom of the screen can't be turned off in the options, limiting your Waldo World real estate. Where's Waldo HD's translation for the iPad is a bit more expansive than I Spy's, including a traveler mode with a little Waldo travel narrative, a free explore mode, and a party mode for competitive two-player Waldo searching.